Willl Austin Home Buyers be Repaying Tax Credits? You are here: Home / Appraisal Information and Tutorials / Willl Austin Home Buyers be Repaying Tax Credits? Did You Take Advantage of the Home Buyers Tax Credit? Many Austin homeowners did, and many may end up repaying tax credits on property purchases that didn’t qualify. Others will have to fight the IRS to have their purchase records corrected in the IRS databases. In the beginning, the Tax Credit was actually an interest-free loan, instituted by the Housing and Economic Recovery Act (HERA) in 2008. First time home owners, defined to be those that had not owned a home in the previous three years, could qualify for a tax credit of up to $7500 if they purchased a home between April 8, 2008 and July 1, 2009. This loan, received in the form of a tax credit, would be paid back over 15 years by slightly increasing the taxpayer’s taxes beginning in the second year after the home was purchased. When the original bill failed to provide sufficient boost to the housing recovery (yeah, which recovery was that? ), Congress passed another bill, the American Recovery and Reinvestment Act (ARRA) of 2009. This new legislative action included another home buyer tax credit, although this time the tax credit was an actual cash rebate of ten percent of the purchase price, up to $8,000. The effective dates for purchases eligible under this act were set for January 1, 2009 through November 30, 2009. 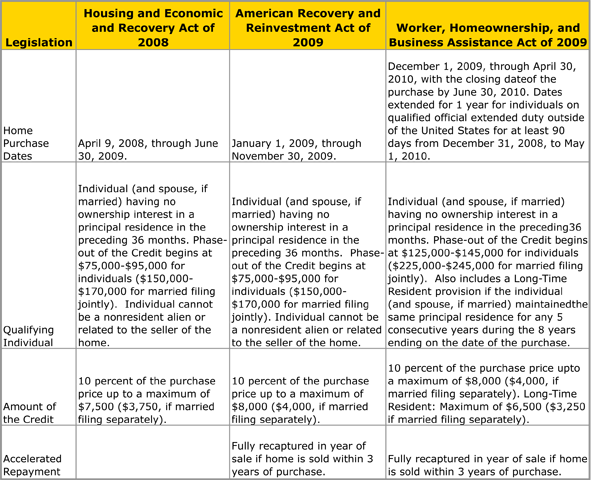 Note the 5 month overlap between the dates for the Housing and Economic Recovery Act (4/8/08 – 7/1/09) and the American Recovery and Reinvestment Act (1/1/09 – 11/30/09). Soon after, when the second bill had also failed to sufficiently stimulate an economic recovery, Congress passed a third bill, called the Worker, Homeownership and Business Assistance Act of 2009. This third attempt to address the myriad economic problems facing our country extended the dates of the $8,000 tax credit through 2010, applicable to homes under contract by the end of April of 2010, set to close by June 30th, 2010. This bill also added a smaller credit for repeat buyers which was worth up to $6500 and provided generous limits for income before the credit eligibility began to phase out. Do you have a headache yet? I know I do. When it became clear that hundreds of thousands of purchase transactions under contract by the April 30th deadline of the third bill weren’t going to be able to close by the June 30th deadline, Congress extended the closing deadline to September 30th, 2010. All three of these bills contained nearly identical provisions for recapturing the credit (returning the money to the government) if the house was sold within three years of purchase and for waiving the recapture if the owner were to die or sell the home without a gain. When taxpayers returns were filed for 2009, the IRS ran into trouble identifying and properly processing returns under the three different sets of rules established by the three stimulus acts. The IRS has incorrectly identified thousands of taxpayers as being required to repay the home buyer tax credit and others that filed for the credit but didn’t qualify. In response, the Treasury Inspector General of Tax Administration (TIGTA) studied the problem and published a report. This report doesn’t seem to have an actual name, so we will refer to it as the TIGTA Tax Credit Repayment Study. Approximately 1.8 million taxpayers claimed a total of almost $12.5 billion in First-Time Homebuyer Credits in Calendar Year 2009. More than 950,000 taxpayers will be required to repay the Credits because their homes were purchased in 2008. However, our analysis identified an estimated 73,119 (4.1 percent) of the 1,774,718 individuals receiving the Credit had incorrect purchase dates recorded on the IRS’ system; 59,802 of these taxpayers purchased their homes in 2009, but the IRS incorrectly recorded the purchases as 2008 or the years were not recorded. These taxpayers could incorrectly receive notices requiring repayment. Will First Time Home Buyers in Austin be caught in this mess? Some will and some won’t. Hopefully those that might will seek the services of a good CPA to make sure their tax forms are in order for 2009 and 2010. If you are one of these home owners, dig out your purchase transaction records, or request copies from your Realtor. TIGTA recommended that the Commissioner, Wage and Investment Division, 1) correct the purchase dates for the 68,924 accounts TIGTA identified as having incorrect purchase dates and 2) ensure the 798 individuals who TIGTA identified as being deceased prior to the purchase of the home are entitled to claim the Credit. In their response to the report, IRS officials agreed the claims for the Credit for the 68,924 accounts were processed early in the program and some purchase dates were incorrectly recorded in IRS systems. The IRS plans to use third-party property records to verify home purchase or disposition information and to refer discrepancies for appropriate resolution. In addition, it plans to audit the 798 accounts and recapture the claims paid out, if necessary.